Photo: Ann Whonnack brushes the log with cedar during a ceremony at CapU on Feb. 25. 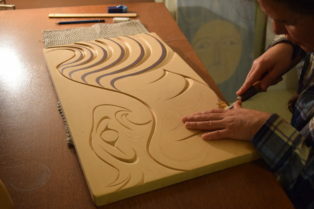 A classical Salish-style canoe is being carved at Capilano University after a blessing ceremony that prepared the log for its transformation. 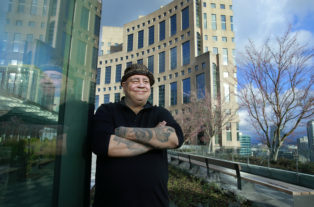 Musqueam Indian Band’s flag has been permanently raised at the University of British Columbia. The flag, being flown beside the UBC and B.C. 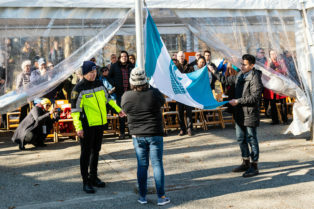 flags, was raised by two Musqueam students during a ceremony on Feb. 25. Joseph A. Dandurand of Kwantlen First Nation sits in a circle of chairs at an East Vancouver library, about to read a scene from one of his plays called Please Do Not Touch the Indians. Photo: William Good (Tseskinakhen) and his grandchildren, great-grandchildren perform a family frog song. 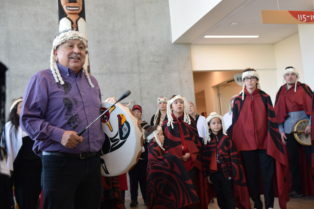 A Snuneymuxw totem representing the beginning of humanity, healing and learning has been unveiled at Vancouver Island University. 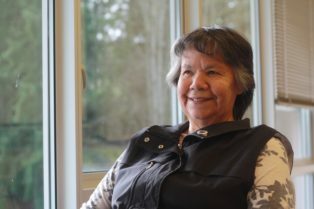 This winter, Klahoose Elder Kenny Hanuse led a procession of band members from the nation’s main office to the community’s cemetary in Squirrel Cove for the burial of two ancestors returning home. 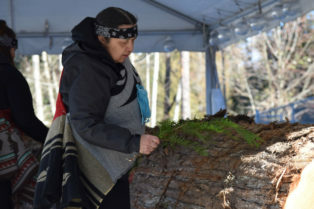 Klahoose youth Brandon Harry and Chief Kevin Peacey carried small cedar boxes containing the remains of the ancestors, recently repatriated from the Royal B.C. Museum. 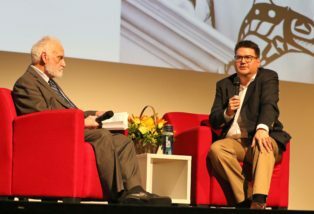 Years ago, Doug White III (Kwul’a’sul’tun) asked his late grandmother Dr. Ellen White (Kwulasulwut) what would be lost when there was no longer a number of people who could fluently speak their language. It’s a shadowy, black night near Second Beach in Vancouver’s Stanley Park, but a warm light emanates from the window of Chrystal Sparrow’s art studio. 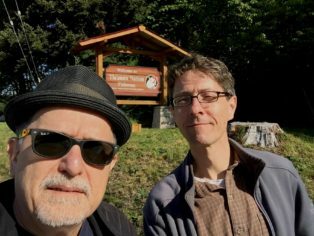 SFU math professors Veselin Jungic, left, and Cedric Chauve at Tla’amin Nation. Submitted photo. A new interactive online tool uses basket weaving patterns from Tla’amin Nation to teach mathematics. 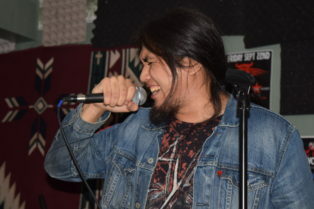 Above: Andrew Campbell of Homalco and Musqueam belts it out during a Tribal X practice in Maple Ridge.